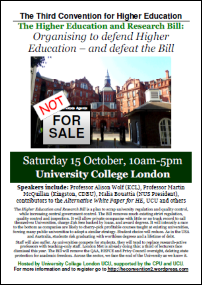 The Convention for Higher Education met at University College London on 15 October. This Third Convention was a working meeting discussing the Government’s Higher Education and Research Bill and organising against it. What can we all do to try to stop the Bill? Organise meetings on our campuses and in our communities. Our first task is to bring people together who want to do something. We can all circulate the link to the ‘College, Inc.’ video to colleagues, include a link to the HE Convention website, and ask them if they’d like to help organise a meeting about the HE Bill. If you are a student, contact your student union. 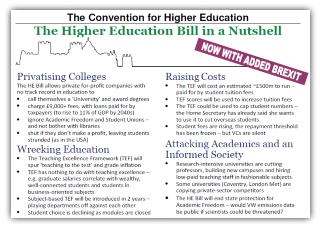 The NUS is campaigning against the Bill. What do student officers think? Will they email students to advertise the meeting? If you are a staff member, approach the UCU, EIS and other campus unions. They all have policy against the HE Bill and will email members to advertise the meeting if you ask nicely! Think about the audience you are trying to reach. If it is a meeting primarily for staff then an hour-long meeting in the lunchtime may maximise attendance. But you can’t show the whole 50 minute film in an hour and have a discussion! Invite outside speakers. If you need a speaker from the Convention, email us or add a comment to the website. Think about whether you want to open the meeting up to a Public Meeting and invite MPs to debate. This can draw a crowd, but you may want to start small and build up to a Public Meeting after the Third Reading. Organise follow-up activities after the meeting. A leaflet that advertises the meeting can also advertise the National Demonstration for Education (Nov 19) or the Lobby of the Third Reading (once the date is announced). Use sign-up sheets to gather names of people who want to get involved. Leaflet canteens, email staff and students, and spread the word! If you are outside of London you’ll also need to plan transport down to Parliamentary lobbies and the National Demonstration. Lobby your local MP in their constituency. MPs have constituency surgeries. You can arrange to turn up in a large group and ask to speak to the MP about the Bill. It can be powerful to send in a student and a staff member as delegates. But this does not mean you should not try to turn up en masse. Numbers turning up in the constituency help remind MPs that they rely on you for votes. Invite the local press. Don’t forget Holyrood, Stormont and the Welsh Assembly! In Scotland, Wales and Northern Ireland, you can also lobby local democratic representatives. There is a huge devolution impact of the HE Bill even though its formal provisions are to be implemented in England. At the Third Convention, colleagues from Scotland and Northern Ireland began to plan launches of the Alternative White Paper in their respective parliaments. This entry was posted in event, HE BIll and tagged campaign, higher education, lobby, MPs, NUS, organising, staff, students, tuition fees, UCU. Bookmark the permalink.